I have only just trembled up on the fabulous Petrie Museum. Like the Pitt Rivers in Oxford, the Petrie Museum is a university museum, and was set up as a teaching resource for the Department of Egyptian Archaeology and Philology at University College London. I am yet to visit but it is rammed full of interesting artefacts from Egypt and Sudan, over 80,000 objects in total! Amelia Edwards donated her collection of several hundred Egyptian antiquities, many of historical importance. However, the collection grew to international stature in scope and scale thanks mainly to the extraordinary excavating career of the first Edwards Professor, William Flinders Petrie (1853-1942) Petrie excavated literally dozens of major sites in the course of his career, including the Roman Period cemeteries at Hawara, famous for the beautiful mummy portraits in classical Roman style; Amarna, the city of king Akhenaten, sometimes called the first king to believe in one God; and the first true pyramid, at Meydum, where he uncovered some of the earliest evidence for mummification. The collection contains outstanding works of art from Akhenaten’s city at Amarna: colourful tiles, carvings and frescoes, and from many other important Egyptian and Nubian settlements and burial sites. The museum houses the world’s largest collection of Roman period mummy portraits (first to second centuries AD). These painted panels illustrate the application of Greco-Roman art to Egyptian burial customs at the beginning of the first millennium. They appear to be naturalistic in style and be a portrait of an individual, while acting as part of the funerary equipment needed for entry into the afterlife. The panels would have covered the face of a mummy but most have been cut out of their wrappings and are displayed separately from the physical context in which they were found. When Petrie first exhibited these panels in London in 1889, he framed many like a European art work. I remember seeing something similar recently in India at the Albert Hall Museum in Jaipur, and they are magnificent reminders and depictions of real people… capturing them before mummification preserved them. Not all panels were removed from their wrappings or mummies. The British Museum and Manchester Museum, for example, display mummies which still have these panels over their face. I am off to have a routle about in the museum as soon as I can get to London! You can come too, and find out more here. I will pop some photos of their collection up once I have been, but here is the sort of thing I hope to find! 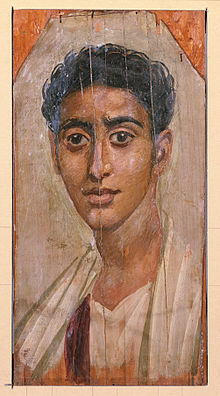 Left, Fayum mummy portrait from the late 1st century CE. Walters Art Museum, Baltimore. Right, Mummy portrait of a young woman, 3rd century, The Louvre, Paris. We have a book of reproductions of the mummy portraits; they never cease to fascinate. Thanks for the info!